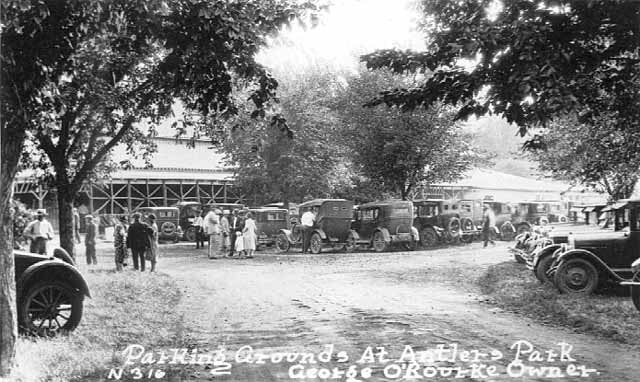 While Antler’s Park was in Lakeville, and not in St. Louis Park, it is important to our story as a destination reached by the Dan Patch Railroad. 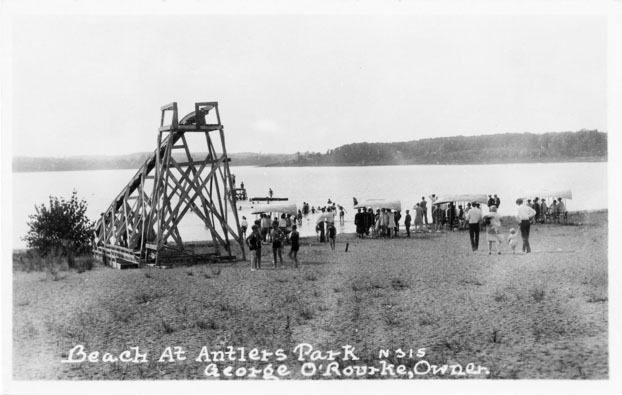 Antlers Park was a 40 acre amusement park located on Lake Marion in Lakeville, Minnesota. Colonel Marion Savage built Antlers Park to attract passengers to the Dan Patch Railroad. In order to attract a multitude of passengers [to his Dan Patch Railroad, Marion] Savage put Antler’s Park on the map [named in allusion to the former abundance of deer in this region]. It was located on the southeast shore of Prairie Lake [renamed Lake Marion in honor of Savage], and contained summer homes and facilities for picnics, boating, swimming, fishing, hunting and dancing. The excursion trains to Antler’s Park were always very crowded. Those who remember riding these crowded trains remember the good times both on the ride and in the park. The college groups usually went to the attractive pavilion. In one end of it, there was an ice cream parlor where sodas, sundaes, pop, but no liquor, were sold. The rest of the pavilion was a dance floor, tastefully decorated. Beautiful chandeliers hung from the ceiling, murals decorated the walls, and the floor was made of exceptionally find wood. The open side of the dance floor had a vine covered walk. There was always a good orchestra and dances were 10 cents for a set of three. The people had a choice of eating a picnic lunch on the well-kept picnic grounds or in an elaborate eating place off the grounds. In the evening a band played music out on the end of the dock. The little children had fun swimming in the clear lake and riding on the merry-go-round and Ferris Wheel. 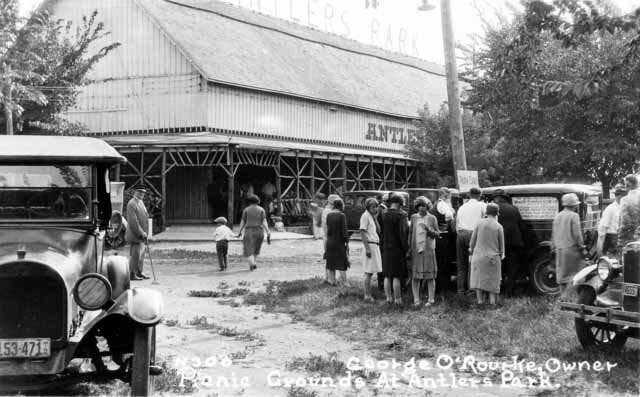 Antlers Amusement Park became one of the most famous amusement parks in the upper Midwest. It contained a lavish dance pavilion with a gleaming oak dance floor; a large bathing beach that featured a dock, diving tower and high sliding chute; a boat dock that offered sailboats, rowboats and canoes; a children’s playground with a miniature operating train for children; tennis courts, an athletic field and baseball diamond with a grandstand for spectators; and an aerial swing. A nine-hole golf course was located nearby. The Dan Patch Railroad Line [provided transportation to the park.] Luxury excursion cars with real leather seats, stained glass upper windows and richly carved and inlaid wood brought thousands of visitors to the park each summer. On weekends in the summer of 1912, these trains reportedly made 19 scheduled runs each day. 1925 photo courtesy Minnesota Historical Society. The area was already popular with wealthy families from southern states who came to escape summer heat and humidity. These families and other visitors stayed in cabins located around the lake or at Weichselbaum’s Resort, which was famous for its fried chicken, apple pie and homemade ice cream. The amusement park declined in popularity in the 1920s and 1930s due to a combination of factors – the advent of the automobile, the Great Depression and several dry years that saw Lake Marion drop to its lowest level ever.